Yes, it’s an interesting title isn’t it? In the dark recesses of my mind, I was aiming for a Stanford Prison or a Philadelphia experiment angle as a suitable opening gambit. The emphasis is on the unknown and the dark unseen forces at work. Yet, Waterford is more than an experiment and as such I do feel I’m doing it a disservice. It’s a fully-fledged operational modern distillery that is seeking to underline the importance of a core distilling ingredient that has been relegated by the whisky industry, whilst making a whisky that puts its Irish and Scottish counterparts to shame. Context is a consideration, as an experiment features controlled inputs and predicted outcomes. On paper all things are possible. When Mother Nature is ushered into the equation such predictability is marginalized, or tossed out of the window. In part, this is the beauty of whisky, as for all the levels of chemistry and white suit discussions, the rigid temperatures and adherence to company guidelines, it’s the unknown element that delights. Here at Whisky Rover, I’ve touched upon the relegation of the human component, skill or craft for what of a better word in recent decades. Technology has been thrust upon us in the pursuit of yields, efficiencies and consistency. The human element has been diminished alongside the important of yeast types and barley strains. Technology should be a tool, rather than the overriding feature. This was reinforced recently as I helped the lads at Dornoch distillery empty their mashtun and gazed onwards as they finished their distilling for the day. Within such a small space, technology is everywhere, but so is the human element. Their craft, passion and endeavour to create a whisky is inspiring and reaffirmed there is a place for technology alongside the human factor. Barely or grains in general, have also suffered from the focus to push limits and reduce costs. How many whiskies nowadays advertise where their grain comes from? Only a handful in reality, gone are the days of local farmers providing 100% of their needs and central facilities now perform the grunt work, sourcing crops from across the United Kingdom and beyond. We’re cast the line that the grain doesn’t matter, the flavour comes from the wood and remainder is the spirit. The rest of the process is merely a stepping-stone rather than a key foundation. 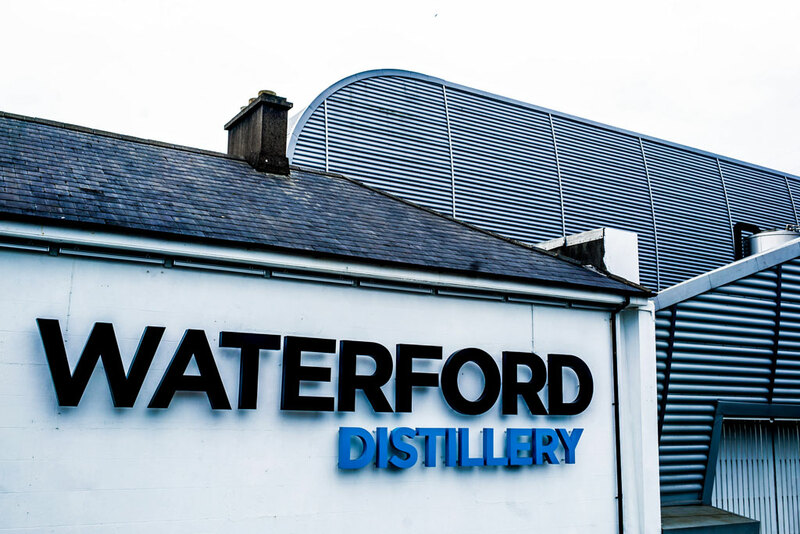 The Waterford distillery is situated in the rich farming community of Ireland, where crops are bountiful and some suggest they produce the best barley. Living in the Kingdom of Fife, surrounded by farms myself, I’ll dispute such a claim, but the abundance of farms ensures this core ingredient will be Irish in origin. For many years we’ve seen Bruichladdich underline the importance of terroir and its impossible to discuss Waterford, without mentioning Mark Reynier, formerly of Bruichladdich. The general awareness of Waterford is only now on the rise thanks to a push via social media including Facebook. Prior to this during my own conversations with enthusiasts, Mark Reynier’s new distillery was the extent of a limited discussion and much speculation. During our Spirit of Speyside residency, one of our Tormore4 membership, was carrying at all times a couple of new make samples from Waterford. This was as far as I know, the first time it had been seen outside of the distillery and Mark Newton was trusted with this precious cargo, which never left his side. During our festival trips, there were opportunities to pour the new makes and witness the fella delve into ambassador mode. During these organic moments, my interest was focused on the participants who listened intently to the Waterford focus on the grain ingredient and also the soil type. The majority just took this as marketing waffle and a new spin to launch a distillery. Yes, I’m sure you’re thinking exactly the same right now, and I know exactly where you’re coming from. The magic moment was when the 2 samples were poured and the interactive element commenced. The reaction was universal, whether it was enthusiasts, aspiring independent bottlers or festival organisers; their senses never lied and the reaction was clear to onlookers. The realisation that they’ve been mislead or had for years based on this experiment soon became apparent. The grain and the soil does promote a distinctive difference that can be nosed and tasted, how this will transmit during maturation remains to be seen. Waterford via their efforts can trace each cask, each drop, each grain of barley, back to the farmer and field. It’s groundbreaking and a new dawn potentially for our appreciation of whisky. Initially cynical myself, it’s only when you have the proof within your hands that the realisation occurs. On that note, I was fortunate to be given a sample of each new make spirit for my own consideration at home. Whilst I know these samples both come from Waterford and their stills, which were formerly at Inverleven distillery that’s all I have at this stage. I have kept the details of the farmers at arms length and will only seek these out when making my final analysis. Waterford have released a series of videos that highlights what they're trying to achieve by working with the local farming community. It's worth spending a little time on their YouTube Channel to appreciate the work and cataloguing that has gone into the project. Now, you could argue that for this comparison Waterford may have given us the 2 most opposite distillations they've harvested so far. Perhaps yes, but if its barley from Ireland, using the same stills, fermentation and cut, it shouldn't matter much now should it? The only other prior review of the Waterford new make that's been highlighted to me is Serge over at Whiskyfun, so this evening I'm in fine company. I doubt either of these are the same new make as Serge's initial run spirit, as if you've checked out the videos or website, they've built themselves a library of possibilities by working with 46 farmers. Even so, I’ve brought consistency to each by using the same type of glass and sitting down in an identical environment for both sets of notes. Please join me now for the Waterford Experiment on a small scale. Colour: well it doesn't really matter just yet now does it? Nose: a ripe fruit basket ensemble with pears, apples and grapefruit. On the fringes a little ash, lime and citrus qualities. It's a fairly light and floral new make. Taste: more citrus, aniseed and freshly sliced green apples. It's not hugely detailed or robust, but floral and a gentle lightness. Nose: immediately this is different with more farmyard qualities, yes there are still elements of fruit but this is a denser and noticeably robust spirit. It lacks the alcohol-edge of Sample 1, its more confined and herbal with elements of mint and vanilla wafer. Taste: gone are the citrus and fruit qualities, instead there's an earthiness and compacted presence. Whereas sample 1 belonged outdoors this feels more clammy, bitter and decomposing. Whatever the tasting notes you can appreciate there is a distinct difference here. I'd say its noticeable to anyone, regardless of your experience in whisky. The questions this raises are endless but for now lets see what these samples were. For the purposes of validity, I then approached Waterford to provide details regarding both of these samples beyond just the farmer name and distillation date that I was provided with initially, it makes for interesting reading. Sample 1 is grower Tom Fennelly, distilled 15th July 2016. Soil Type: Fine Loamy Drift, Elton Series, Dunboyne Series, Howardstown Series and Straffan Series soils, N.W. Sample 2 is grower David Walsh-Kemmis, distilled 20th February 2016 who is in the video above. These farms are about 30 minutes apart as you can see here. From Waterford's analysis, Tom's soil is lighter, whilst David's is denser and more clay-like in nature. Without question you can nose and taste the differences and what is more remarkable is that Waterford has confirmed the same barley variety was used i.e. Taberna. Whilst I had heard Mark Newton's ambassador chat several times over our Speyside weekend to put it politely, this was over a month ago and after the first few monologues I tended to hit mute and just watch the reactions. There's something in this soil lark let me tell you and if you're offered the same opportunity then please do grab it. The experience has broadened my appreciation and questioning of what has gone before. Lets look forward to the future and whether these defining differences will continue during maturation.